Well, the author is a Tarot reader herself and so this book makes a lot of sense.. I, on the other hand was introduced to Tarot about a decade or so ago, and since then I have strong belief in it. I have a few friends who are Tarot readers and it always amazes me the things they share. That apart, I did not know much about Tarot. So reading this book was quite a different experience for me. The book opens with an Introduction that concludes with these words "Tarot tells you what you need to know and not what you want to know". Over the past, I have come to understand the true essence of these words.. Yes, when you go for a Tarot reading, you need to have a few things in mind - belief, and a few *to the point* questions that you ask the reader to help give you clarity in life. And with reference to the title "Something else", Nisha explains that people are always looking for something more than just a reading. She says this book will be more than just about Tarot cards, it will give people something they can relate to, understand and associate with. The one thing I understood at the end of it was that it was a well thought out book- the subject was dealt with under different sections, clearing giving an introduction to each chapter. It made it easier for a novice to understand what it was about and how one should approach the same. 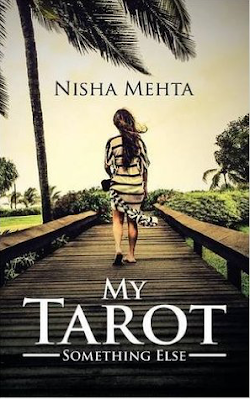 For example, this statement Nisha makes in the book “Tarot is not restricted to images and their interpretation only” is so true.. She has explained each deck, the main cards, and how a beginner should approach the tarot cards as well. Not just these, but you gain insight into how to read the cards, almost like a list of top 4 things to follow towards the end of the book. The best thing about this book was the simple language, clear explanations and even the diagrams to explain how it works. So, if you have been hearing the word "Tarot" from your friends/ if this is something you have been curious about, do give this book a shot and let Nisha know what you thought of it.